During my recent trip to Olanchito, I could not help but notice that Ramon Amaya Amador is Olanchito´s favorite son. You walk into the park and there is a bust of him in the most important area of the park. The city´s famous library is named after him. 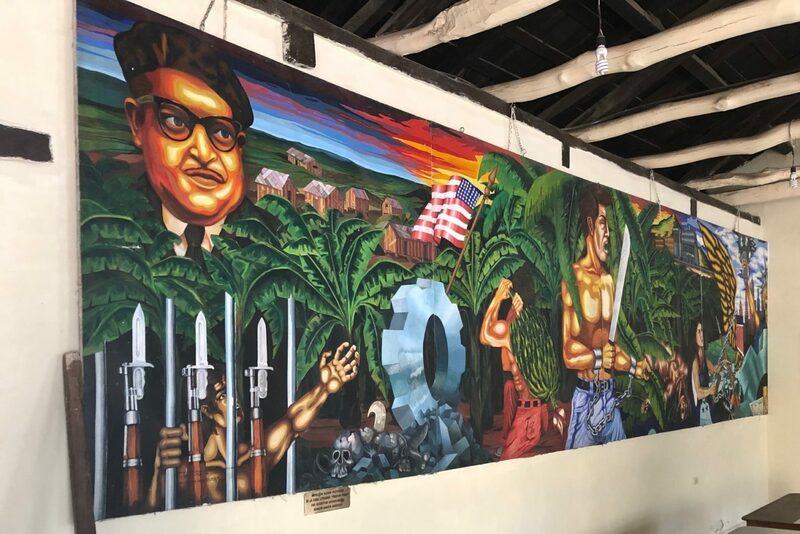 Within the library, you can find a large mural that includes him as part of the History of Honduras. So, I asked myself who is this so-called Ramon Amaya Amador and why are the “Comejamos” so proud of him? Ramon Amaya Amador was born in Olanchito on April 29, 1916. Thus, during all his life the Standard Fruit Company had a deep influence in the region. Amaya Amador worked in the banana plantations in the Aguan Valley. There he became politically motivated to promote the cause of the hard-working Honduran peasants who made it possible for the banana companies to run a very profitable business. This was during the hay day of Honduras as a Banana Republic, and local workers did not have many rights. Ramon Amaya Amador’s biggest claim to fame comes from his historical novel titled Green Prison (Prision Verde). Prision verde is a novel that depicts social realism. It is the first important “banana novel” in Honduras. Although you must read it with a grain of salt, as the author was certainly a communist at heart. Yet, you must also remember that the banana companies in Honduras were capitalist to the bone. The novel was first published in Guatemala and Mexico and was written in 1945. By then Amaya Amador was living in exile in Guatemala. The Honduras government saw him as a public enemy and a member of the illegal Communist Party of Honduras. There is no doubt that his novel had an impact to the events that led to the 1954 banana strike in Honduras. Ramon Amaya Amador spent his later years in exile, first in Guatemala, and then in Argentina and Czechoslovakia. He died in an airplane accident near Bratislava when he was 50 years old, in 1966. He wrote several other novels. Most of which saw the light after his death, in posthumous publications. Olanchito and El Progreso were two communities that were in the heart of the banana era of Honduras. Both share the distinction of being a cradle of liberal thinkers who fought to improve the quality of life of the workers at the banana companies. If you visit Olanchito, make sure that you stop by the Casa de la Cultura, that is across the street from Central Park. There you will see an interesting mural where Ramon Amaya Amador is an important part of the Honduras´ History. If you want to read a book about life in Honduras in the first half of the twentieth century, the Prision Verde is an absolute must! This is a great novel that was once outlawed in Honduras. It probably had a big influence in days prior to the Great Banana Strike of 1954. It is certainly one of the most important books about Honduras.